Following the statutory retirement of some members of Management, within the last three months, the Management of the Nigeria Customs Service has been reconstituted with appointments of four (4) Ag. Deputy Comptroller-Generals and seven (7) Ag. Assistant Comptroller-Generals. 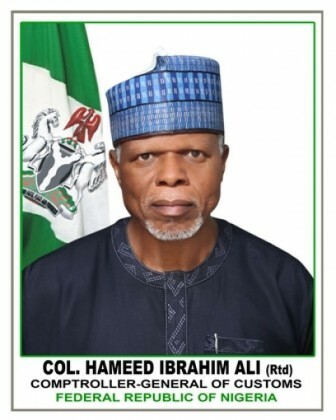 While re-constituting the new team, the Comptroller-General of Customs Col. Hameed Ibrahim Ali (Rtd) also approved slight redeployment of 8 Comptrollers to re-engineer the management of the Service for efficient service delivery. DCG UMAR IYA ABUBAKAR who was formally in charge of Tariff and Trade now moves to Finance Administration and Technical Services. As the new members of Management come on board, the CGC charges them to bring their experiences to bear in the administration of the Service. He said the modest achievements of the ongoing reform agenda in the areas of revenue generation, anti-smuggling operations and trade facilitation must be sustained and improved upon in the interest of the nation.